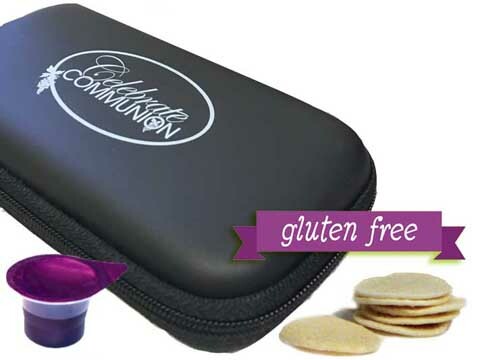 Unique travel Communion case is customized to carry 6 prefilled Communion juice cups, included, and tin of 1.25" gluten free wafers, included. 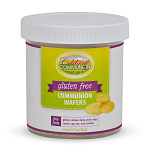 Portable visitation set contains 6 ready to serve prefilled Communion juice cups, screwtop carrying tin with 1.25” diameter gluten free Communion wafers and handy scripture reference card. Handsome black case is made of smooth vinyl with velour lining, mesh interior storage and zippered closure. With compact dimensions of 3" x 6" x 1-1/4" the travel kit easily fits in a briefcase, purse or backpack or can just slip into the pocket of your slacks. 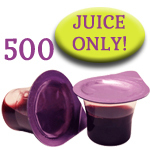 Convenient size makes it a great accessory to carry daily for care visits in home or hospital, small groups, prison ministry, mission trips and retreats. Service men and women can even take these into remote locations. You’re always prepared with this travel Communion case. 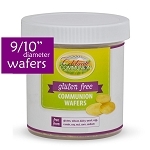 Replenish the supplies from any sized box of prefilled Communion juice cups and don't forget to select your style of gluten free wafers too. 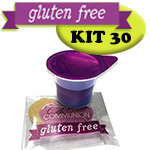 When you use Celebrate Communion's prefilled Communion cups you'll have more time to spend in fellowship and prayer!